We were finally able to get out of the house today! Thank goodness, because I had a serious case of cabin fever. My cabin fever was so bad I went outside in just a fleece jacket to de-ice our vehicles so that we would not have to do it in the morning when we both have to return to work. I spent a good 20 minutes chopping through thick ice on both of our cars, which I figured was a pretty good workout! We ended up going to the store for provisions for the week, and to lunch. I was just grateful to be OUT OF THE HOUSE. I hate being cooped up with no way out! Today’s eating was boring–not a lot of variety and I ended up being short protein at the end of it, so I drank the rest of a bottle of Isopure (yech! ), which I only reserve for times like this. I managed to hit 82 grams of protein, 34 grams of fat, and 34 grams of carbs. Not a bad day, really. But I like more variety in my eating. This is both a good and a bad thing. Today’s food choices were boring! 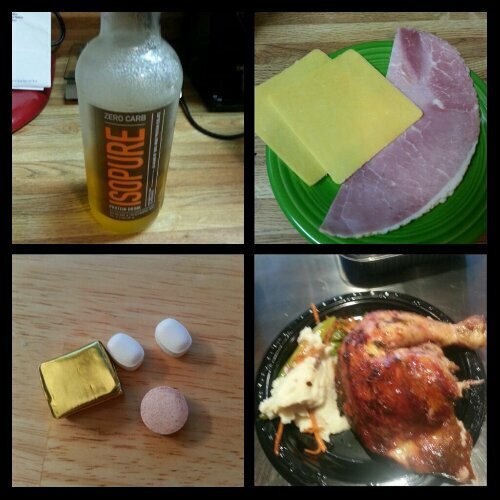 But here they are, from upper right: Boar’s Head sweet slice ham slices and Tillamook sharp cheddar cheese; rotisserie chicken, mashed potatoes and sauteed snap peas and shredded carrots; multivitamin and calcium supplements x2, iron supplement; Isopure Zero Carb (just a cup). Not shown: a baguette slice and a slice of house seasoned roast beef. This entry was posted in daily bites, eating, post-op, the sleeve, vsg, weight loss surgery and tagged daily bites, eating, ice storm 2013, post-op eating, post-op life, VSG, vsg realness, WLS. Bookmark the permalink.